I am using the Sony AX33 Camera. I would like to know how I can get to the option such that I can get to the option where I can shoot with frame size 1920 X 1080 and Frame Rate of 29.97 fps. Currently, I seem to only be able to get to the 1920 X 1080 setting when I choose HD, but then it shoots in Frame Rate of 60fps. The user manual should be your first place to look for this. If you don't have one, then Sony usually provide them as PDF files on their website. Their User Manual shows you how to change the settings, but when I choose HD, it records with frame rate of 1440 X 1080. The user manual does not show how to change that. The user manual does not show how to change that. Do you have link to PDF version? Hi Thank you, but this still does not help. You see when I select XAVC S HD , it still records in 1440 X 1080 in stead of 1920 X 1080. i know this for i use adobe premiere to edit. It is all 3 options that define recorded media, not one. 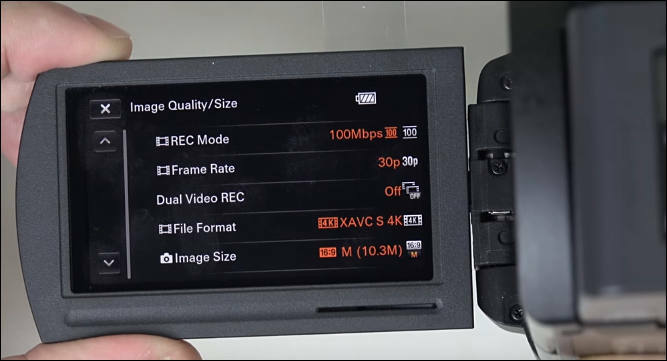 I select FileFormat - XAVC SHD I select FRame Rate at 30p. Dual Video Rec is OFF Rec Mode is 50 MBS. As I told, tell me that MediaInfo shows. I was just wondering what does Mediainfo have that ADobe Premiere Pro doesn't. I mean in adobe premiere it tells me the frame size. Try to do that I asked.